A short distance from the historic Woodstock Opera House is one of the state’s premier nursing homes – Crossroads Care Center of Woodstock. With results-focused therapy and skilled nursing care, we champion the social, emotional and physical care of the residents we serve on a quiet, wooded site in rural Woodstock, IL, just a little more than an hour by train Northwest of Chicago. Reach your full potential with our mix of compassion and skilled care. The compassion our staff offers while providing quality care to you, or your loved one, is one of the key ingredients that makes short term rehab at Crossroads Care Center of Woodstock so successful at helping residents to get back on their feet. The other ingredient is the quality of care we provide. Working in conjunction with your primary care physician, our skilled nurses and therapists provide short term rehab that is also overseen by our on-staff physiatrist. The therapy we provide includes occupational therapy, physical therapy, respiratory therapy, infusion therapy and, ortho/bone and joint replacement therapy. We also provide wound care and we have onsite dialysis. While we provide these forms of specialized care for short term rehab, we also provide them to residents who are here for long term care. Additionally, we partner with Advocate and Centegra hospitals’ post-acute care networks and their physician groups. 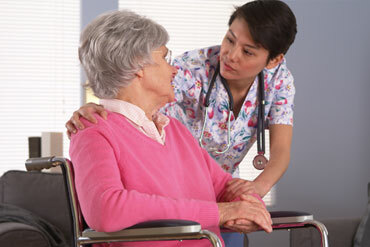 The care we provide is tailored to your, or your loved ones, individual needs. Working with our staff nurse practitioner and certified physician, our physiatrist creates a specialized rehabilitation plan for each resident. Our reputation for providing the highest quality of care goes a long way to giving our residents and their families greater peace of mind. Quality amenities and activities are keys to social and emotional care. Crossroads Care Center of Woodstock is only three blocks away from the Woodstock Square, which has a full calendar of events – from weekly Farmers Markets in the warmer months to Fair Diddley and Fall Diddley, where arts and crafts are sold. The Square is also site of the annual Mozart Festival and home of the Woodstock Opera House where renowned performers, such as Orson Wells and Paul Newman got started in acting. The town is rich in opportunities for dining that make our monthly lunch outings a big hit. We also have seasonal field trips, but you don’t have to go out from our nursing home to socialize and have an engaging time. We have a gardening club, a favorite of many residents, as well as musical events and weekly movies with popcorn. And residents have access to religious services and Bible studies to meet their spiritual needs. Our rooms, including private and semi-private rooms, are beautifully decorated to give residents a sense that this is their home-away-from-home. We have wireless internet service and an on-site beauty salon with stylist services, plus we offer personal shopping services. Amenities and activities are matched by quality dining served in our two dining rooms. Our expert kitchen staff prepares meals that are created to meet individual dietary requirements. Alternate menu selections are available with each meal.